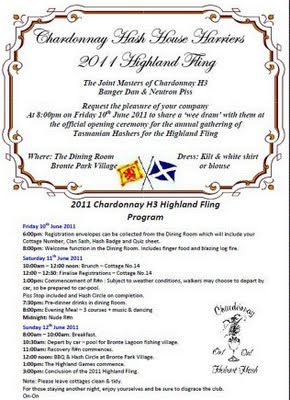 Devonport Hash House Harriers: Highland Fling this weekend! That's right! 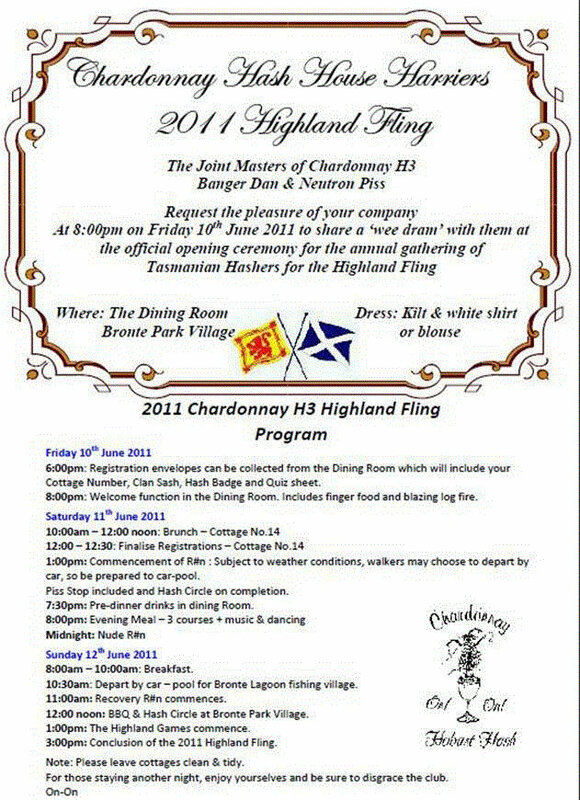 Highland Fling this weekend. Hash Monks are putting in a combined effort to keep the weather out, so why not help them by doing a little rain dance right now. Anyways, you may also like to know what transpired last Monday. Tracka was due to set a run, and we had all hoped for a cryptic piece of paper and no proper real trail, tons of pizza to help digest our beer and a happy Tracka, but to our surprise Dyke showed up instead. He told us that Tinsel was struck with a bad case of lets just say Tinselitis for now and needed hospitalisation! The good man Tracka is gave Tinsel the time and care a Hasher of her caliber deserved and delegated the run out to Dyke. A cold long run for the runners, and a merciful marathon for the walkers was what Dyke had in store for us. Tinsel was sick and we were not meant to be happy. After 7+ kilometers the smiles were frozen off our faces and once warmed up at Dyke's abode we dug into the dim-sims. What followed we can only presume was a sign of Dyke's allegiance to Democrat Wiener (who has recently been in the news because of photos of his wiener) inspired him to boil up some wieners for us. With a dash of home made rhubarb pickle, with a dash of chili, it did us well. 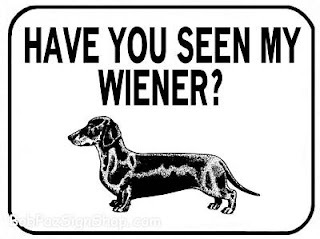 The beer was awesome, the raffle was wrigged and the prizes were palatable just like the wieners. OnOn Dyke for rescuing the situation and OnOn to Tracka for being a good husband and we all wish Tinsel a quick recovery and hope to see her come back to Hash soon. Next Run from Otto's Grotto, expect burned buggers and a long run. Bring thermals and a smoke mask... BYO Liquor Licence.